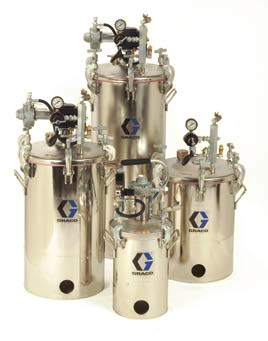 Designed with electroplated surfaces that prevent debris build-up and keep your operation free of contaminants, Graco pressure pots are precision welded and surfaced. The siphon tube and bottom outlet of the pressure pot allow for different feed methods, and the liners make clean up easy and mess free. They also meet our stringent internal requirements that exceed industry standards such as ASME and FM.